If you have two or more websites managed by TE3, you will definitely want to link them together into a “Network”. You'll be able to monitor and control multiple sites from the “Network” menu, as well as sync almost any action you perform on one site to your other sites. You must have at least two TE3 sites linked together, otherwise network features have no meaning. View statistics and graphs for all the sites in your network in the “Network” menu. You can completly customize it by creating and editing network interfaces (use the Interfaces button). Learn more about available parameters here. You can switch between sites at any time using Network pulldown menu at the top of the admin interface. To make it more comfortable, we've added a feature that always positions you to the same menu when switching between sites. You can export trades from one TE3 to another. Go to the Overview menu. Checkbox trades that you would like to export. Mass edit panel will slide up. Click on the Export to network, select sites where you would like to export trades to (CTRL + left to select / deselect) and click on the Export button. You can export trades from one TE3 to another, even directly from the “Add trade” window when you are adding a new trade. Navigate to the Overview menu and click on the Add trade link at the top right side. Add trade window will pop-up. Enter trade data, scroll down to the bottom, select sites where you would like to export this trade to (CTRL + left to select / deselect) from the Add this trade to the following sites table and click Add button. Checkbox settings you wish to synchronize and click . 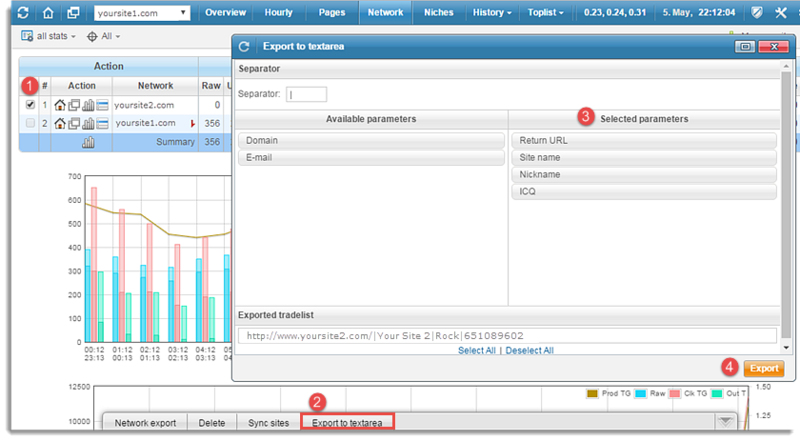 All the features included in the “Network export module” can also be synced from their respective menus (e.g. you can sync trading rules from the Sign-up page window, Mailer settings from the Mailer window…). You can export info for selected sites as customized text format. This feature is especially useful, if you add a new trade and the webmaster for this trade also wants to add your other sites. Click “Export” button to generate your “Sites info” text.